In the wilderness, water coming from a natural spring is probably your best bet. Most issues are not knowing the source or what’s in between. There are very few places where you might be certain that the water is safe to drink. How many minutes does it take to boil water until it’s safe to drink? By the time water reaches a rolling boil, it will be safe to drink. – Water could also contain bacteria or viruses. 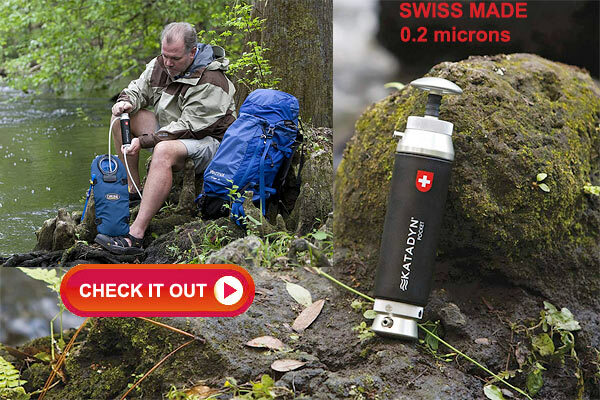 Ever been afflicted while on a vacation or hiking or camping? It most likely was caused by contaminated drinking water that you thought was perfectly safe… “Giardia”. Boiling is the most certain way of killing all microorganisms. Water temperatures at 160°F (70°C) kill all pathogens within 30 minutes. 185°F (85°C) will kill all pathogens within a few minutes. Water that has reached a rolling boil will have killed all pathogens. So in the time it takes for water to reach the boiling point all pathogens will be killed. The moment your drinking water reaches a rolling boil, the water has already become safe to drink. Looking at their collection of testing records & data for bacteria, virus, and protozoa (source below), the worst common denominator is for Giardia (protozoa). They note 10 minutes at 70°C will provide ‘2 log’ thermal inactivation of Giardia. The problem is (at that temperature) we’re only looking at 99% reduction. We would like to see 4 or even 5 log (99.99% to 99.999%). 1. Boiling water will NOT remove chemical toxins that may be present. Water may be toxic from sources like pesticide runoffs, direct dumping or indirect leaching, mine tailings, and so on. Boiling, filtering, or chemically treating water can remove or kill microorganisms, but it will not remove chemical toxins. 2. Filter dirty water with a cloth or other material to remove sediments. You might let it stand for awhile to allow sediments to settle – then pour off clearer water on top. A coffee filter makes for a good sediment trap. Boiling temperature changes with altitude. The higher you are, the lower the boiling temperature of water. At 10,000 feet, water boils at 193°F (just about 90°C). So you’re looking at “a few minutes” tops, to sterilize water. The CDC recommends boiling water for 3 minutes at altitudes above ~6,500 feet (2000 meters). Stop wasting fuel! You do not need to boil water for 5 minutes, 10 minutes, 20 minutes. Or “double for high altitude”, or whatever else you’ve heard. What temp is that water? Pocket Thermometer? Ok, I’m going to add a couple of Common Sense items here just cause. 5. If you plan on only heating water to 160 deg. how do you know it’s 160 and not 140 without a Thermometer? Boil it. 6. Got a hot-pad or gloves for the 212 deg. boiling pot of water you’re reaching for? I will admit that sta. of 90% of water is contaminated is quite shocking, makes ya wonder how “clean” that Tap-Water really is don’t it? Here is a little fact I dug up, again Just Cause; As per the “WHO/UNICEF Joint Monitoring Program 2017 report on the progress of drinking water recently published its 2017 update”…. If you want to store Berkey filters activate them 1st in clean water and let dry for about 2 weeks turning every 3 days or so. This will prevent having to deal with finding clean water to activate. Not to hijack the thread, but I just set up a new Berkey with the two black filters down in coastal FL. The filter was unable to strain slightly sulphuric/swampy taste and smell out of the water. I thought the Berkey was supposed to convert pretty much any variant of H2O to clear pure water. Could they have sold me a “Chinese” filter? Any thoughts appreciated. That “gassy” swampy smell will only dissipate on aeration of the water. Multiple filtrations will be needed. 1 Did you flush the filters prior to use as stated in the manual ? 2 use red food coloring to check the filtration it should come out clean. 3 I’ve heard some water in Florida are really high in sulfur content. By the way, the ‘food coloring’ test is not definitive. It’s water soluble so it may get through the filter pores anyway indicating a false-positive. “Most dyes go into solution (molecular), not suspension (particle) form”. Note that a charcoal filter stage may absorb food coloring, but charcoal is for neutralization of odor and flavor. Ken, the test is recommended by Berkey and the prepper store I bought it from. Is that water coming out of a municipal piping(city water) or a well? Out of a well. About 150 yards from the Atlantic Ocean.. I just boil it. Still taste terrible but it is what it is. As NRP states be very careful of cross contamination during filtering or boiling. I’ve made mistakes and paid for them. If you are going to boil the water anyway….make coffee. Or make beer. There’s a reason why our ancestors brewed beer. It was safer than drinking water. Boiling town tap water also rids the mandated Chlorine and Fluoride. Less chemicals inside you = good. Those ice machines in restaurants rarely are cleaned – be wary of icy sodas. Do not consume drinks with ice in third world countries. The drink itself may have been sterilised but the ice may have been made from unfiltered tap water. The drinking container may also not have been washed in unfiltered or unsterilised hot water. Never drink the water in hotel rooms in third world countries. The maid may have filled up the water jug with tap water. Check any mineral water bottle carefully and make sure it’s not been tampered with. Maids often open the bottled water, drink the contents and fill them up again with tap water. Just to be clear, boiling does NOT remove Fluoride from water. In fact it will concentrate it as the water boils down. Boiling will indeed speed up the evaporation process to rid chlorine. 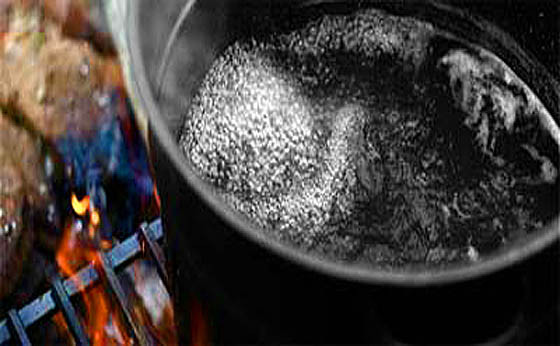 Charcoal filter will also bind the chlorine ions to the surface of the charcoal. We had a real crappy situation in Cozumel Mexico a few years ago . The hotel manager said only drink the bottled water in your room , no tap water .We did, but 1 morning we noticed the gardener filling the water bottles with a garden hose out in the patio. Too late , most of our group had been staying hydrated with the room water bottles . Montezuma got his revenge ! how good is the LIFE STRAW at getting out harmful stuff? Kevin, I remember watching the guy on doomsday preppers drink out of a toilet. I almost puked…. I’m one of those people who over boils. I’m aware that statistically I don’t need to, and I think it’s important that if you do over boil, you do so of choice, not because you’re uneducated on the recommended times. I prefer to over boil to protect against the unknown. The new yet to be discovered stronger virus or bacteria that being at the wrong place and time puts in my cup. I’m not interested in being a patient zero. However, sometimes you can’t spare the fuel/power to over boil, and that’s where knowing your recommended times is important.